Designed to add a near OEM shine to the matte finish of Full Dip products. These are designed for FullDip, we've seen them work fine over PlastiDip, but you should add a few layers of PlastiDip extra to ensure peelability. We recommend you use 2 medium coats of this over a whole can of standard coloured dip. Remember to leave 12 hours between the last coat of dip and first coat of super gloss. Using the gloss too quickly before the dip has dries / cured may result in reactions and or not a very nice finish. Includes one standard white nozzle. Long research and development process from pioneers in the liquid vinyl. 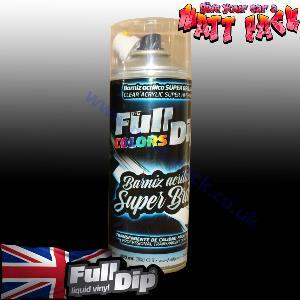 A Full Dip 400ml spray covers up to 1.2 m2. No cracks or self peeling with the time. For instructions see our Installation Guide.